Another day, another poster. 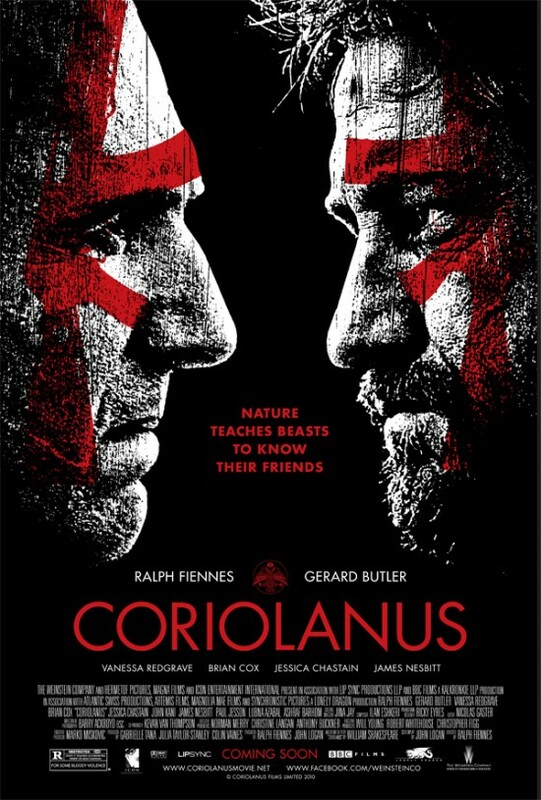 Interesting that they’re selling this one less as The Ralph Fiennes Show (he is Coriolanus, after all) and more as a two-hander. It’s worth playing up Gerard Butler’s contribution — his performance here is a career highlight — but I maintain my broken-record position that Vanessa Redgrave is the real story here. Meanwhile, I’m slightly surprised at what a slick marketing push this one is getting: the film is more of a curio than you might think. Interested to see how this pans out. Full poster after the jump. I’m guessing they know Butler is a proven leading man; Fiennes is too, but his more mainstream efforts tend to have him doing supporting work (I’m sure a depressing amount of people know him from Harry Potter and nothing else). The color scheme turns a generic poster, into a very good one. Nice tagline …. but not even a nod to the guy who came up with it? I think that there should be more movies that modernize Shakespeare’s work (10 Things I Hate About You, Baz Luhrmann’s Romeo + Juliet, She’s the Man). I’m also a fan of war films, so I can’t wait to see this. From the clips I’ve seen this past weekend I’m very impressed with the atmosphere combined with the Bard’s literal lines. Also, I’m very eager to see how well Butler holds up against all that raw acting power. Also, I’m very eager to see how well Butler holds up against all that raw acting power. He holds up just fine. In fact, I think he comes off — dare I say it? — a little better than Fiennes, whose performance really runs hot and cold for me. Volumnia really is the standout role in the play itself. I once went to an avant-garde production where the actors performed while mingling with the audience, and Volumnia actually attacked me, jabbing her finger into my chest and screaming at me. If Redgrave captures the energy of the role itself, she really should be on her way to another nomination.